Tocino de cielo is a very typical dessert in Andalucia (region at south of Spain), it seems it was invented by nuns long time ago when they received a lot of egg yolks discarded from the wine clarification process (done with egg white) in Jerez de la Frontera (widely known for it’s Xerez wine). It’s very similar to creme caramel but with a stronger taste. A really delicious and easy dessert to cook. First step is to prepare the syrup, on a sauce pan add 200 gr of sugar and 150 gr of water, move in order to dissolve the sugar on the water, once the water starts to boil maintain with low fire for about 12 to 15 minutes. Move some times carefully. Once the syrup is prepared, let it cold. While the syrup reduces its temperature separate the egg yolk from the egg white, to do so break the eggs and pass the egg yolk from half egg shell to other half until you get only with the egg yolk, add the egg yolks on a bowl and whisk them. When the syrup it’s warm add it slowly to the whisked egg yolks while whisking. Now let’s prepare the caramel, putting on a pan 2 tablespoons of sugar and half tablespoon of water, start stiring when the water boils and maintain in the fire until turns to toasted colour. Then without wasting a second (otherwise the caramel will solidify and become useless) add a bit of caramel in each mold, and with the help of a cloth make the caramel stain a bit the walls of the mold. Then add the mix of egg yolk and syrup on each mold. Cover the molds with tin foil, to prevent them being filled with water, cause we will cook them on bain marie. On a pot place the molds and add water until more than half height of the molds, cover the pot with a lid and cook for half hour once the water starts to boil. Once cooked keep on the fridge for at least one night and delight yourself with this dessert. Some days ago I tried to cook a cookie creme caramel, but the result was not good enough to publish it, I didn’t use enough milk and the texture was not appropiate, I was ready to repeat it correcting the quantity of milk and my brother came up with a suggestion: use oreo cookies instead of regular cookies, now you have the result. We will start grinding 4 oreo cookies in a mortar with the help of a pestle. On a bowl add 2 eggs, 100 gr of sugar through a coliander, like a spoon of vanilla extract, ¼ litre of milk, and whisk it. Add the already grinded Oreo cookies and whisk again. To prepare the caramel put 50 gr of sugar in a hot pan, shutdown the fire when sugar gets melted. Put a bit of caramel in each mold, but be careful not touch them because they will be heating like hell; finally fulfill each mold with the mix. 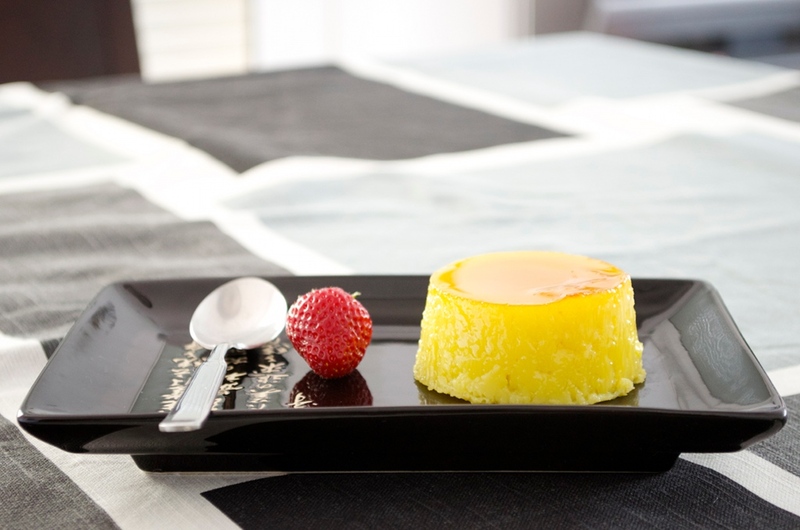 The creme caramel is cooked using bain-marie, put water on a large pot, put the molds on and cook them for 1h 45min, check regularly there is still water and add more if needed.